﻿ News Bharati - 'Talking trade', India-China trade relations bloom..! News Bharati - 'Talking trade', India-China trade relations bloom..! 'Talking trade', India-China trade relations bloom..! New Delhi, January 23: India and China developing over the extant trade relations, concluded their two day discourse over the progress made under Regional Comprehensive Economic Partnership negotiations and efforts to strengthen bilateral trade with his counterpart. 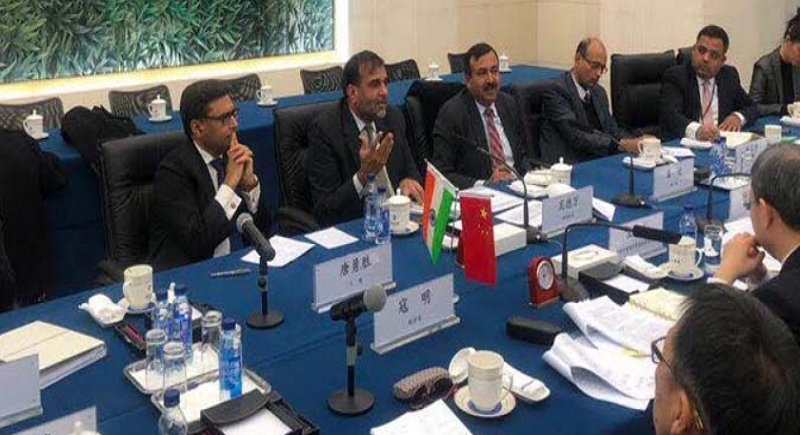 Indian Commerce Secretary Anup Wadhawan, on his two day official visit to Beijing, also had a brief interaction with Indian IT and pharma companies present in China. During the meeting with Zhang Jiwen, Vice Minister of GACC, the Commerce Secretary complimented GACC for expeditiously addressing some long pending market access issues after the Informal Summit in Wuhan between President Xi Jinping and PM Narendra Modi. The protocol on exports of non-basmati rice was signed in June 2018 on the sidelines of the SCO Summit. India and China meanwhile also signed the protocol for exports of Indian tobacco to China. This recent period has thus seen significant progress in market access for 6 agriculture and allied products from India. Wadhawan urged GACC to expedite market access for other products like okra, soya bean, bovine meat and dairy products. The two sides also held a detailed discussion on the widening trade deficit. Wadhawan pressed for more actions from the Chinese side to support and promote exports of Indian products to China. He also pitched for more market access to Indian IT companies, pharmaceuticals and agriculture products, including major commodities like sugar, rice, milk and milk products. He noted that as a large producer of these commodities, India can emerge as a most reliable source for China. GACC has approved 6 Indian mills to export rapeseed meal to China. The protocol on exports of fish meal and fish oil was signed during the visit of China’s Vice Minister of GACC to New Delhi in November 2018. China’s GACC has also deputed experts to inspect Indian soya bean meal establishments and pomegranate orchards and pack houses in December 2018 and SPS Protocol for these products are at advanced stage of discussion. Regional Comprehensive Economic Partnership is the most important on going regional trade Agreement which aims at integrating major economics in Asia, which constitutes 30 per cent of world GDP and 45 per cent of world population. Negotiations were conducted across all the three pillars of RCEP, i.e., goods, services and investment. Bilateral negotiations between India and China are crucial for early conclusion of RCEP negotiations.